Knights of Creativity Spirit & Ale: Thars Gold in them there Hills!! I sometimes see a news item and think i'm missing a few tricks in life. I mean, i'm a metal detectorist, i know that most fields in the UK have dozens of items dropped in them over the centuries, and then I saw this item below in the press and it got me thinking. For most tourists, no trip to Britain would be complete without a visit to Buckingham Palace or Stonehenge. But for this group of Americans, a small muddy field in the heart of Norfolk was reason enough for their trip. 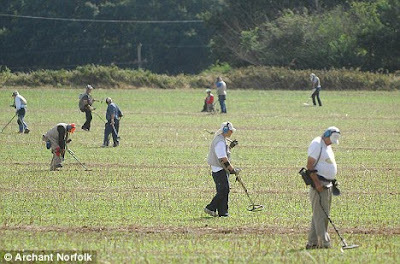 They are among 21 metal detector enthusiasts who have paid more than £2,000 each and flown thousands of miles to discover the treasures scattered across East Anglia. Heads down and brows furrowed, the group spent most of their eight-day holiday patiently waiting for the small 'beep' that would tell them their efforts had been rewarded. Most appeared so deep in concentration that they were unaware of the glorious rolling countryside around them - and the rare sunny weather. Each was armed with their very own detector, which projects an electro-magnetic field into the ground and beeps when it comes into contact with anything metallic. But although the Americans were determined to 'touch the hand of history' by finding an ancient artefact, most were left with just an old tin can or used shotgun cartridge to show for their labours. One enthusiast, Jim Normandy, 79, a retired pharmacist from California, said he was 'thrilled' to unearth a 17th century button. 'We have been coming here for 19 years, first to Kent but mostly to Norfolk, because there is so much history here,' he added. He paid £2,200 for the trip, excluding flights, and stayed at the same Norfolk hotel the group have chosen for years. There, after hours of sweeping harvested canola fields, each find was meticulously logged. But they have also found objects dating back to the Iceni tribe, Bronze Age axe fragments, as well as Roman jewellery, Saxon brooches and medieval money. Their most successful find this trip was a gold 'Angel' coin from the time of Henry VII. David Barwell, a former chairman of the National Council for Metal Detecting, who selected the fields for US tour operator Discovery Tours, said: 'You will see our objects in displays at Norwich Castle Museum. 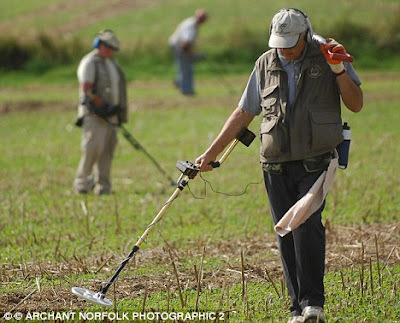 'The experts are keen to have the help of responsible detectorists to help them piece together Norfolk's history. When I was around 16, my best friend and I went in together on a metal detector. It had no headphone jack and made an awful buzzing noise that sent humans running and dogs into an angry pack of wolves wanting to gnaw the leg off anyone holding a metal detector (okay, I made that last part up, but it was an awfully sound). Okay, it also couldn't discriminate between gold and an aluminum pop-top or chewing gum wrapper. We dug more holes than a gopher on met amphetamines -- with practically nothing to show for it. But, I wouldn't trade the TREASURE HUNT experience for anything.